Mark Iles has been working in the jewelry industry for almost three decades now. He began his work in the industry after he completed the Jewelry Manufacturing Arts Program in 1988, graduating from the Gemological Institute of America. The first job position that he had was for a jewelry manufacturer. He worked as a jewelry designer and as a wax carver. He focused on sculpting a line of wildlife-themed rings. Many of these are still available in the market. He continued working for the jewelry industry until he left sometime in 1992. After he left the jewelry industry, he decided to go back to school and trained as a CNC technician. He then learned embroidery digitizing. It was the work that he did for approximately 18 years. After twenty years, he decided in 2012 to again work for the jewelry industry. He trained himself in Gemvision’s Matrix Program. His entry to the Gemvision-sponsored Matrix Design Contest that year was awarded the third prize in technical merit. 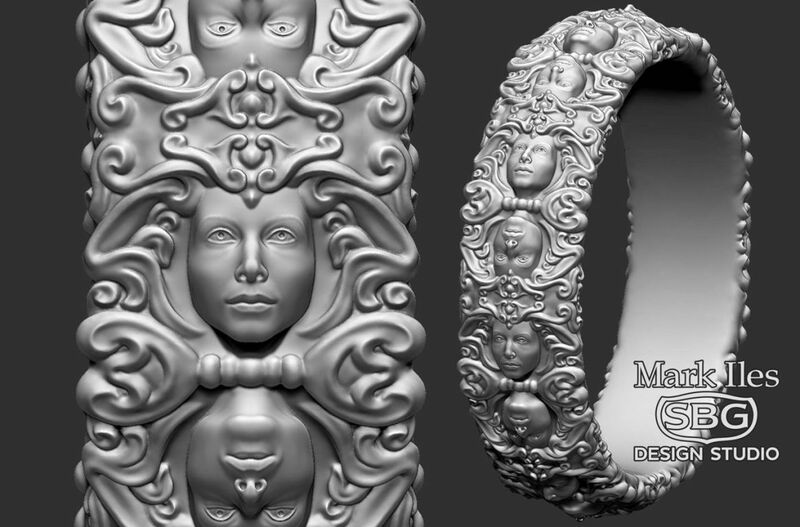 He has known about ZBrush from a friend and from many other sources several years before purchasing a copy of it. He previously used regular CAD programs, particularly Matrix/Rhino and T-Splines. Mark also said that Tomas was very generous when it comes to his feedbacks to students. Tomas freely imparted his knowledge and experiences in the jewelry industry. According to Mark, Tomas encouraged his students to find their own voice as designers. When it comes to specific jewelry piece he designed, he does not have any particular piece that he wants to boast about. He just enjoys doing pieces that incorporate figurative sculpting. “None of these pieces were particularly time-consuming, but were fun to do. A time-estimate for a project like the vine ring would probably be in the 8-hour range, and some of the detailed family crest intaglio rings I’ve done might take up to 16 hours."